We are now just 2 days away girls and I can feel the electricity in the air! 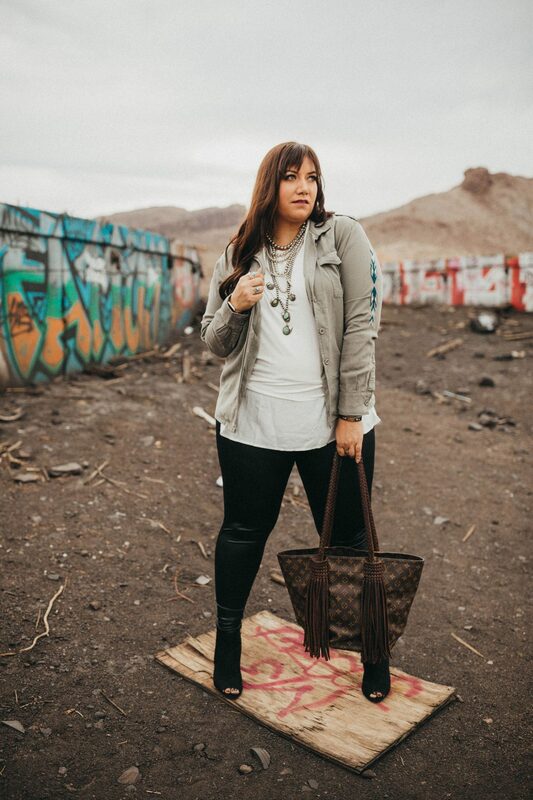 Tonight we sit down with another up and comping western fashion blogger Shaley! But better known as @WestDesperado she has great style and loves to share others whose style she admires! She is so encouraging to others especially myself! I’m so excited to meet her and everyone else!! H: What are you looking forward to in Vegas? S: This will be my first time attending NFR festivities while in Vegas so I’d say I’m most excited for shopping Cowboy Christmas! I love to online shop as much as the next gal, but it will be amazing to get to see all the awesome shops in person. H: What is your favorite place to eat in Vegas? S: I am all about buffets, especially for brunch! The Wicked Spoon in the Cosmopolitan has an amazing selection for a pretty fair price. Make sure to check out their dessert bar! H: What is a must see or do in Vegas? S: The Bellagio Conservatory and Botanical Garden is always a must stop for me in Vegas. The sky-lit atrium features beautiful floral scenery like you’ve never seen! Also, it’s free to walk through, so you can’t beat the price for the amount of beauty! H: What is a must have for a first timer to pack to survive in Vegas? S: Eye brightening cream. There is so much to do and see in Vegas and never enough time! Late nights and early mornings will start to catch up to you by day 3. Try Neutrogena Rapid Dark Circle Repair eye cream. Start using a few days before you take off to Vegas and use throughout your stay in order to keep your excited glow! H: What trend are you most crushing on for Vegas? S: I am all about velvet this year! They come in beautiful jewel tones and all different styles from bell bottoms to dresses. I will be packing a few different pieces for Vegas! H: What is 1 piece of style advice for Vegas? S: Don’t be afraid to be yourself! You can follow all the trends you want, but if you aren’t in your comfort zone then you’ll be missing out on the fun of showing the world who you truly are! Add at least one piece of personal fashion flare to each outfit that reflects your own style! That is such great advice in my opinion too! Be you and be comfortable it reads all over your face when you are not. So even when trying something new just add a piece of you! I love it! Thank you so much girl for being a part of this year’s Countdown 2 Vegas! This beautiful lady is definitely no stranger to my blog interviews! I like to call on her fashion eye whenever I can! I have been known to text her at the last minute for an extra styling eye as well! She is not only a fashionista these days though she is a thriving business women (Lipsense ladies, if you need some holler at her! ), an amazing mom and an awesome wife! I am so blessed to call her one of my dear friend. So without further ado let me introduce you to the beautiful Ashley Minor wife of NFR Qualifier Brady Minor. A: Shopping! I love shopping in Vegas! And in a more sentimental note having our son Maverick watch his dad! H: What is 1 must have for a first timer to pack to survive Vegas? A: Tylenol, just joking!!! A trendy pair of flats! Your feet get tired by round 2! H: What is 1 piece of style advice for Vegas fashion in your opinion? A: You can never be overdressed! Take advantage of being in Vegas and crack out all your bells and whistles! Haha I totally agree with that I go ahead and try all the new styles I am crushing on in Vegas because anything goes! Ash thank you so much girl for being a part I can not wait to see you and Mav this week! Ladies be sure to follow her on Instagram @AshAMinor for all her amazing styles she will be rocking! She most definitely a trend setter! I can hardly believe it y’all we are 4 days away I repeat 4 days away from this year’s Wrangler NFR! Holy smokes where did the time go this year?! It has flown by so fast and in this amazing year I have become closer friends with fellow blogger and Bleacher Babe Squad member Janzen Riley Jackson aka Rodeo Vogue! If you are not following this beautiful babe what are you waiting for! Not only does she have an amazing eye for Western Fashion but she also has a heart of gold and you will not be disappointed following her you will definitely be inspired! You can follow her blog here Rodeo Vogue and on Instagram at @RodeoVogue . She has some fun and amazing things going on in Vegas and you won’t want to miss out on knowing the inside scoop. But let’s dig in and see what advice she has for us for Vegas along with some of her favorites! J: I’m looking forward to several things. Watching Cody rope at the World Series Finale, a release of custom dress hats at American Hat World, and getting to see Dwight Yoakam in concert. And of course catching up with a lot friends. J: This is a super hard question I’m such a foodie but I love Cabo Wabo. You really you can’t go wrong with any place in Vegas though. I could name so many more. J: If it’s your first time definitely watch the water show at Bellagio, take a stroll down the strip during the day and at night and last but not least go to Fremont street it’s super cool there! J: Hangers. Really weird I know but I can’t stand wrinkled clothes and if you are there with multiple people in the room or longer than the weekend they are such an essential piece to have. Steam your clothes with the iron in your room for a polished style. J: CRUSHED VELVET!!! I don’t think I have to say more. I’m all Stoney LaRue over here cover me in velvet! J: More than anything stay true to you! Yes, Vegas is fun to get to dress up but if you try and change your entire look just for it then you most likely won’t enjoy your time there because you’ll be to busy fussing with your clothes. Just jazz your personal style up and have fun! I could not agree anymore! Thank you so much Janzen girl for joining us on tonight’s Countdown 2 Vegas! Ladies do not forget to follow this beautiful babe you will not want to miss her Vegas outfits I promise! I may or may not have had a sneak peek of some outfits! We are officially 5 Days away from the Wrangler NFR! Seriously are y’all ready? The excitement is most definitely in the air! I am excited to bring back my Countdown to Vegas where I enlist in the help of some of my amazing fashionista friends for their thoughts and opinions because let’s face it we all draw inspiration from each other! Plus it’s fun to connect with different people with amazing and different styles! Today I have asked fellow and up and coming blogger Ranchers Roadie Ashley! I have gotten to know this beauty through Insta fashion! I love her style and she most definitely has a heart of gold! Let’s see what some of her musts and advice are for Vegas! A: I am definitely looking forward to all the fashion. The western world has BLOWN up and has taken a whole new spin. Everyone has learned to emprace their own style and I LOVE it! A: I love Toby Keith Bar and Grill. It is good food and a fun atmosphere. I am wanting to check out Heart Attack Grill this year!! A: You must go check out the Vinitian Mall. Even if your broke it is fun to eww and aww over all the designer digs. H: 1 must have for a first timer to pack to survive Vegas? A: Comfy walking shoes. The traffic is awful and it is 90% walking. Also have a open mind (it is a whole different world). A: Definitely the boho hippy vibe with a mix of rock and roll. It is a fun mix of 70s and 80s. I love it! H: 1 piece of style advice for Vegas fashion in your opinion? A: My greatest advice is to be you! Don’t try and blend it with all the girls. Own your style and rock it! I could not agree more with that Ashley!! Thank you so much for being a part of this years Countdown to Vegas! Ladies if you see this stunning beauty in Vegas be sure to go say hi to her I know she would love to meet you! Also you can follow her on her blog Ranchers Roadie and follow her on Instagram @RanchersRoadie you will not be disappointed either I love following her and her style! Check Back with us tomorrow to see who will be joining us! Hey my amazing readers! I am so excited for our 2nd Annual Countdown to Vegas! We are 6 days out from the Wrangler NFR and who is ready for a fun year or Rodeo, Fashion and Friends! This girl right here is! I think Western Fashion has really exploded over the last year and I am really excited to see everyone and see all the amazing fashion brought by totally fabulous women! One thing to remember ladies is to stay true to who you are and just rock your amazing self!! As we kick off this countdown instead of going last I thought I would go first this year! Here is my must pack necessities to survive Vegas! Especially if you will be out there for the whole duration! This is amazing for all those long days on your feet especially you beauties that are working. Take a soak in this to help the soreness or even just your feet! Haha seems like a duh but its always nice to go ahead and stock up on these because well they are kind of like socks they disappear fast lol! There are a few different kinds depending on what you need but these honestly really help save your feet. Choose the one or ones where there is the most pressure applied to your foot and I promise these will not disappoint! Save those feet you need them until you can wear those Uggs all the way home when you go on a fashion strike! lol! These are a couple of my personal essentials from Rodan +Fields! These are life savers to me girls! Especially the eye cloths double as a makeup remover and the eye cream helps keep you and your eyes feeling and looking fresh and takes the puffiness away! If you need some holler at me! A great moisturizer or chapstick is super great to have in the dry weather of Vegas to help keep your lips staying hydrated and not to look chapped or cracked! My favorites again I sell with Rodan + Fields! I think this is a given why you need this little guy, you just never know, always be prepared I like to say! Ok ladies! Yes this is great to have to help you stay classy for those low cut blouse or even to help keep things in check! No uh oh moments! Haha! This was totally fun to help give y’all a little must have list for surviving Vegas and the Wrangler NFR! I want to thank Janzen my friend and fellow blogger for helping me put this together! She had a little insight to go along with my 11 years experience. Together we are here to help y’all survive! Be sure to follow her as well at www.RodeoVogue.com and @RodeoVogue on Instagram! She’s amazing and her fashion sense is stunning I can not wait to see her NFR Fashion as well as she will be joining us here on the countdown this year! Excited to see everyone out there and always remember, every good and perfect gift comes from above. (James 1:17) That includes your amazing self and you are perfect just the way you are!